On My Plate: How "Killer" Is Killer Burger? How "Killer" Is Killer Burger? I ordered the meal at 11:30am and it arrived hot at 12:09pm. I was impressed. I had the Peanut Butter Pickle Bacon Burger, which comes topped with; bacon, PB sauce, smokey house sauce, mayo, grilled onions, and pickles; for $9.95. My best friend recommended it, so my expectations were a bit high going in. I will say, it was a big burger. All burgers are cooked to order and mine was medium rare, just as I had asked. The bacon was crispy and the large slices of pickle had a good dill flavor. The onions and house sauce were present, but didn't really bring anything to the party, positive or negative. However, the peanut butter sauce did not work for me at all. Looking back, I don't know what I expected. I guess I thought the sauce would have a peanut flavor but be more balanced. As it was, it just tasted too sweet for a burger. At least, it was too sweet for my burger. My friend had the Classic Burger. The Classic Burger typically comes with bacon, American cheese, lettuce, tomato, smokey house sauce, grilled onion and pickles for $9.95. However, she had them hold the house sauce and grilled onions, and add extra pickles. My friend's burger arrived medium well and was modified just as she asked. As for the fries, they only offer one size, which I would "large," since it's enough for two people. If I'd known we would automatically get fries with each of our burgers, I wouldn’t have ordered the $3.00 box of fries as well. As it was, we had way more potato than the two of us could eat. They were cut a bit thicker than I normally like, but they were very crispy and seasoned well. I can't really rate Killer Burger, because I believe I ordered the wrong burger. 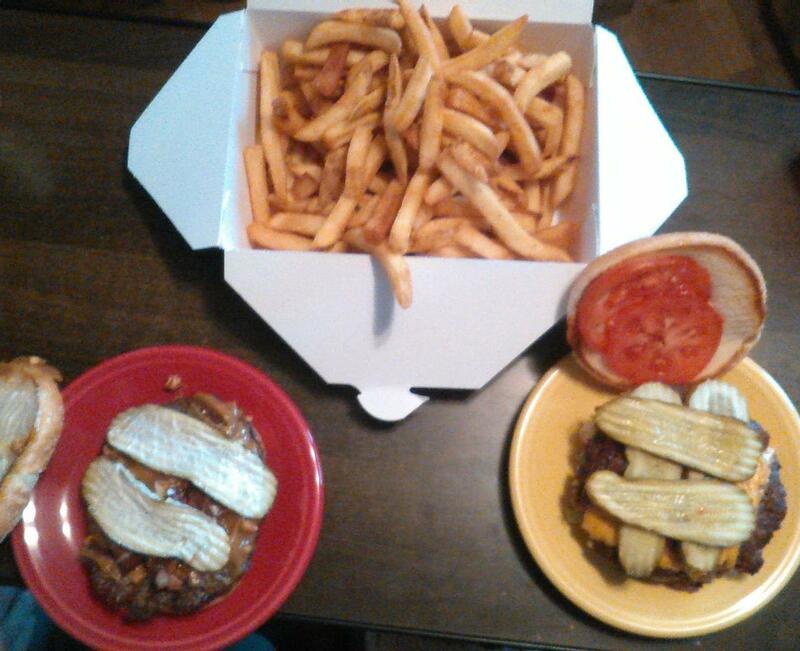 The friend who recommended the peanut butter burger is a huge fan of Elvis Presley. In retrospect, I should of recognized her bias for peanut butter and bacon before I ordered it. Nevertheless, we got exactly what we asked for exactly the way we asked for it. Next time I will order the Teemah Burger (bacon, house sauce, bleu cheese fondue & crumbles, grilled onions & pickles) to get a clearer picture of the restaurant.